we provide appraisal services in Eastern Massachusetts in the counties of Middlesex, Essex, Suffolk, Norfolk, Worcester and Plymouth. Since 1992, we have built a solid reputation within our industry for having a unique customer-driven approach, with a value system based on integrity, quality, passion and expertise. With an unparalleled portfolio of capabilities and a relentless drive to add value and exceed expectations, our approach continues to contributed to the growth of our business and the level of the service we provide. We are dedicated to providing valuation and consulting services through analytic discipline and a team approach. Our company's philosophy is to provide an objective analysis to assist our clients in making informed real estate decisions. Our reports are prepared with the precision that the industry demands with all major property types included. 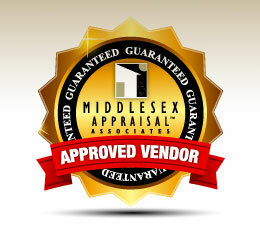 We have (10) full-time appraisers specializing in residential property appraisals in Eastern Massachusetts. All our appraisers are either Certified, HUD/FHA approved and/or Licensed appraisers. Although residential appraisals may be our specialty, we offer a variety of appraisal services certain to suit your appraisal needs. At Middlesex Appraisal Associates, emphasis is placed on quality service to ensure our clients receive complete and accurate appraisals. We'RE ON THE "APPROVED VENDOR LIST" of over 75 AMC's & local banks. When you choose Middlesex Appraisal, you are choosing a real estate appraisal company with a history of competent performance. You will be serviced by the best in the industry with a professional staff experienced in all complexities of the process. Our pleasant full time office staff is always available to answer your questions, guide you through the process and give you up-to-date information on your appraisal. We produce high quality appraisal reports: Our commitment to the industry and the utilization of superior technology has allowed us to provide better service to our clients while controlling cost. Our appraisals include digital photos, location maps, flood maps, floor sketches and the ability to electronically transmit reports to our clients. We utilizing the most up to date software (Clickforms), enabling us to produce quality reports with fast turn-around times. Clients have the ability to order an appraisal on-line and check on their status at anytime by accessing our website. Our system is updated daily so you are always in the loop... from the appraisal request through delivery. why you may require our service? We are experienced at performing high-quality property appraisals for banks and lenders. . We hope this site provides you with everything you need to know about Middlesex Appraisal Associates and the Appraisal process.